House Majority Leader Matt Ritter consulting with House Speaker Joe Aresimowicz. At left is Matthew Brokman, the caucus chief of staff. Connecticut’s legislative leaders struggled into the early morning Wednesday in negotiations to resolve what may be the state’s strangest budget fight: It’s not about money. In a state with a $20 billion budget, the Democratic and Republican spending proposals on the table in the early hours of Wednesday differed by just $19 million. That’s a rounding error — less than one-tenth of 1 percent. Sources said leaders from both parties reached a tentative framework on a bipartisan deal shortly after 1:30 a.m. that closed the remaining gap. But most of the disagreements discussed Tuesday, sources added, involved what are intended to be election-year talking points separating the parties as they struggle for clear control over what is now a closely divided General Assembly. Ending collective bargaining for retirement benefits, leaving all of these matters to be resolved solely by the legislature. Suspending cost-of-living adjustments to pensions for retirees who became vested after mid-2027 until the system holds enough assets to cover 80 percent of pension obligations. The funded ratio currently stands at less than 40 percent. These proposals not only echo recommendations made earlier this year by the state Commission on Fiscal Stability and Economic Growth, but also past Republican budget proposals from this year and 2017. “This is not something new,” House Minority Leader Themis Klarides, R-Derby, said late Tuesday, adding that Republicans believe these structural changes are a crucial response to surging retirement benefit costs stemming from decades of inadequate state savings habits. Her party needs a net gain of five seats to win a 76-75 majority. “We want to put the future of the state of Connecticut in front of politics,” Senate Republican leader Len Fasano of North Haven said, adding he was cautiously hopeful a bipartisan deal could be struck before Wednesday’s constitutional adjournment deadline. The Senate now is evenly divided, 18-18. Both GOP leaders said they remained committed to talking with their Democratic counterparts. And House Speaker Joe Aresimowicz, D-Berlin, said Democrats are communicating with the GOP and with Gov. Dannel P. Malloy, a Democrat whose administration was largely snubbed last fall as lawmakers agreed on a bipartisan budget. Malloy is not seeking re-election. But the speaker also said it’s harder sometimes to resolve philosophical differences in a budget than differences in bottom-line spending. “There’s no way with 25 1/2 hours to go that major structural changes in how government operates are going to go forward,” Aresimowicz said late Tuesday night. The key, he said, is to find compromise. But that also means running proposals past a House Democratic caucus that includes some wary of these and other collective bargaining changes. “That’s a huge hurdle,” he said. 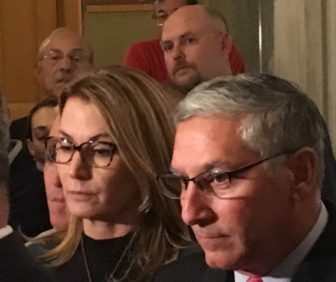 The GOP leaders, Rep. Themis Klarides and Sen. Len Fasano. 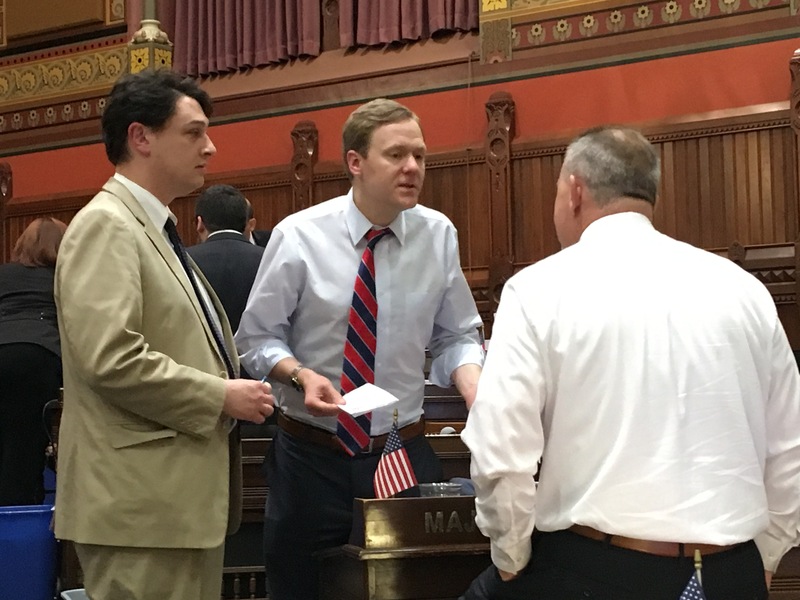 The Republican budget incorporated proposals from the fiscal stability panel and from the Connecticut Conference of Municipalities regarding collective bargaining. It would shield a portion of a city or town’s emergency reserve from being considered in the binding arbitration process when calculating a municipality’s ability to cover employee raises, and it would prohibit communities from entering into contracts that restrict their ability to employ volunteer services. Between 1939 and 1984 the state saved little in advance of state employee retirements to cover pension benefits, forfeiting huge investment earnings, according to a 2014 report by the Center for Retirement Research at Boston College. That only changed after employee unions took the state to court and the two sides negotiated a new way to save for pensions. “When that didn’t happen, nobody paid attention to” properly saving for pensions, Pelletier said. But the fiscal stability panel noted that Connecticut now is a national outlier and few states negotiate retirement benefits. Though this was a major sticking point to a bipartisan budget deal, sources close to the talks said there were a few other issues. A Republican proposal to freeze hiring and reduce departmental salary accounts by more than $80 million had some Democrats wary agencies would lack the staff to carry out vital programs. The GOP moved to take another problem off the table earlier in the day Tuesday when it agreed to support a proposal from progressive Democrats to restore $12 million to the federal Medicaid-funded health insurance program for poor adults, Husky A. Advocates say this funding would enable approximately 13,500 adults from households earning between 155 and 138 percent of the federal poverty level to retain state-sponsored coverage. Mitigate most of the cuts to the Medicare Savings Program, a medical assistance program for seniors and the disabled — without imposing any asset test as discussed earlier this year. Restore most of the $94 million in municipal aid compared with the current fiscal year, returning funds for poor, middle-income and wealthy communities. The budget also would prohibit the governor from reducing municipal aid while trying to meet legislative directives to achieve savings after the budget is in force. Defer plans to lock into bonding covenants with investors new statutory caps on spending and borrowing adopted by the legislature last October. The administration had been tasked with achieving unprecedented savings targets this fiscal year and Malloy — who has met those directives — has said on several occasions that he had no other option but to include town aid on a broad list of programs that had to be reduced. Both parties’ budget proposals would spend about $206 million more than is authorized in the preliminary 2018-19 budget lawmakers enacted last spring. Both plans also would tap roughly $300 million of this spring’s unanticipated, $1.3 billion state income tax windfall. The legislature was supposed to save those funds, which were identified through a new “volatility cap” system. The rationale for this new system is that the capital gains portion of the income tax represents one of the most volatile revenue streams in the state budget. Since the income tax was enacted in 1991, this component frequently varies from year to year by double-digit percentages. In other words, Connecticut cannot assume that if revenues in this area surge dramatically this spring they will do so again one year from now.